The Summer 2017 IC Optimist has now been sent by e-mail and/or US Mail to our current ICN paid members! Your copy should be arrived shortly if it has not already arrived! Feature Story: Master Class – The Broad Picture of Interstitial Cystitis by Kenneth Peters MD is the best educational article we’ve read in a decade about IC. Clinical Trial Announcements – The global Leadership 301 Study is seeking patients throughout the USA, Canada and in several European countries. Feature Story: Finding Comfort With Pets – Stacey Shannon explores the special love pets offer in times of illness. ICN Fact Sheets – We include updated copies of all of our IC Fact Sheets, including a new one on IC Subtypes! 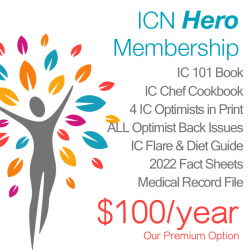 To receive our magazine, you must become an ICN Member! *Immediately available for your download of our magazine & includes all updates during your membership period. 2. Send me an email (customerservice@icnsales.com) or give us a call (707.538.9442) to tell me that you would like your membership credit. I will then forward your request to my team!